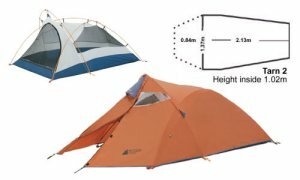 A tents review of different styles and models. A tents review of the different types of tents on the market is not exactly what this page is all about. It’s more about what type of tents Irma and I have had over the years, what other folks have used and what we have found to be useful knowledge if we had to purchase another one. So we are not going to do a scientific test or anything like that. What we will do is tell you how we and our four children discovered the tents that worked for us over the years. So let’s get started with our tents review. Away back in the early seventies, our little family had grown to the pair of us and four young daughters. We took up camping as something to try one weekend and eureka!!!! We were hooked. At the time we lived on Cape Breton Island in Nova Scotia and we lived two hours from the Cape Breton Highlands National Park. Quickly we discovered we had a problem. Our little 8’ X 8’ tent we paid $39.95 for at Kmart was away too small. We purchased a larger one. At that time affordable tents were chiefly made of painted canvas. The new tent measured about 10’ X 15’ and didn’t have a fly. The walls were slanted outward and that became a new problem. If we left the flaps down to cover the screen windows, the rain would pour in. If it didn’t rain and we left the flaps up the tent would breathe and the roof would remain dry. A couple of years later we stored the tent in the barn on our property in the country. Big mistake. The 24th. Of May weekend the next year we headed for Ingonish in the park. Opened up the tent (another mistake, should have done so at home) and discovered the squirrels who had been living in the barn that winter decided our tent material would be perfect for their little quilts, and tore out the entire corner of the roof and wall. Fortunately, we found a cabin for the night. Next day a total stranger in the local general store offered a gallon of floor tile cement he had at home. The store keeper had informed us none was available. With the cement, and the flaps from the front screen room, we built a new corner for the damaged tent and used it for a few more years. After our girls went off to run the world, we purchased a 3 person dome tent. We used that for years, backpacking into wonderful areas and using it in campgrounds on an eleven day trip across Canada to the Yukon Territory. We used it many times in the Whistler and Vancouver area. Finally we donated it to a relief program for the people of Guatemala after a hurricane devastated their country. There are many styles of tents. And many different prices and qualities. We will try to explain this in our tents review. Price usually is dictated by the work that goes into the manufacturing and the material the tent is made of. Stores like Pro Bass and Canadian Tire in Canada as well as many others, generally carry the lower priced tents. Portable tents. Large family camping tents, and many styles of tents. These tents, although lower priced, will last a very long time if treated properly. Specialty stores such as Mountain Equipment Co-op in Canada and Eddie Bauer, L.L.Bean carry the higher quality tents and are generally quite a bit more expensive. These tents are for the real tenting enthusiasts who want to use them not only often, but roughly or in tougher circumstances. Let’s examine a large family camping tent made by Coleman Tents. I want to start tents reviews with this one because I would guess that you have tried camping and have decided you want to do it often enough to warrant a larger one for your family. This tent has loads of room. Three rooms. Sleep in one or two, use the other for clothing, backpacks, bicycles, games, etc. Even use it for a port a potty. Why not. Did you ever try to get into a busy campground restroom in the morning? After the last line-up we gave up and bought one. It was a smart purchase. Of course this tent weighs 24 kilograms (48 pounds) and is for camping and not packing. The following tents reviews are for the die hard camper/backpacker. OK. You’re single. Enjoy walking and the outdoors. 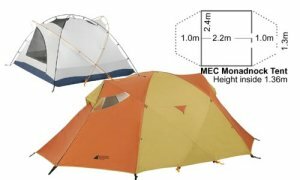 Check your specialty camping store for one man light weight tents. When you decide to buy backpack tents you will be ready as every ounce you can keep off your back counts. Just enough room inside for you in your sleeping bag, plus your backpack. Two person tents are popular since they really will sleep three friendly people who may want to backpack it. Ours weighed 4kg (9 pounds) but was worth carrying as it had to hold three big men. It did. Now the weight has been cut even more to about 3.3 kg (7 ¼ pounds). The special material the floor is made of is almost totally waterproof. We were camped in the Cape Breton Highlands one night when a rip roaring electrical storm packing winds of at least 100km (60 miles) per hour repeatedly knocked our tent flat against us. The rain pounded us creating a wild stream right under out tent. We didn’t get a drop of rain inside. Our friends, sleeping in an older, poorer quality tent were soaked and didn’t dry out for a whole day. 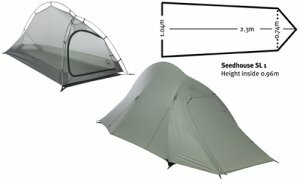 Our tents review features the 4 person 4 season tent. If you are contemplating sleeping in the outdoors in winter in a tent this is the type you should have. Lots of room for four with their gear. Our tent reviews would insist on vestibules to allow entry from either direction (keeps the wind under control), well ventilated without danger of leaking. Weighs about 6.5 kg (14 pounds) but a pleasure to use. Winter camping is fun but only if your equipment is able to stand up to it. Check out our page on our Camping equipment list by clicking here. For the serious big camping tents these are beautiful. This is the grand-daddy of them all. Holds 5 people comfortably or fewer with lots of packs. You may have asked why don’t they build a tent like a family tent but with the best material? Well, they have. This tent is a beauty. There are larger tents but not better ones. Weighs 7.8 kg (17 pounds). That’s a lot if you are carrying it a long way, but with 5 persons one can carry it and the others the rest of the gear. 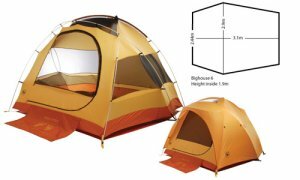 When we wanted to do a tents review, we chose this tent as the best for a large family camping tent. Our wish is that this information in tents reviews will be of use to you when it’s your time to purchase a new tent. Your Sleeping Bag is one of the most important pieces of equipment you will need. Consider making your own. If you may be looking for a large family tent be sure to check out your military surplus outlet and search for a military surplus tent. These tents come in all sizes and seem to last forever. By the way, when you get ready to carry on camping you should check your camp cooking supplies and update your campfire recipes list for the latest camping food ideas. You may also buy a camp shower that is simple to set up and gives you the chance to take a shower while in camp. For instance, camping in Yosemite park draws large amounts of visitors and the showers are not readily available. Camping on the gulf may not be so crowded but the shower makes it easier.